We transport cargoes along different routes around Europe and the CIS countries using our own state-of-the-art transportation. Working directly with carriers without intermediaries not only will you save your money and time, but also you will always have accurate information about movement and delivery terms of your cargo! 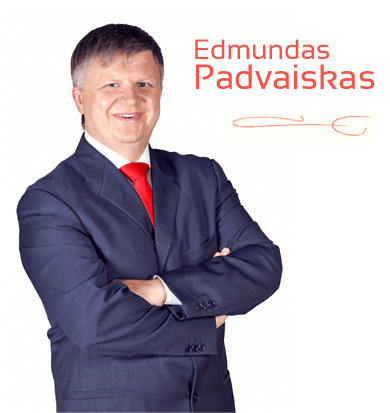 Lithuanian transportation business environment is quite complex and dynamic. Only the strongest and the most flexible companies survive the challenges posed by changes in that environment. Having survived various crises we have become more mature, have learned to solve problems in quicker and more effective ways, as well as to optimize costs. For 23 years we work growing everyday. Not only we have been growing our fleet, but also we have developed the concept of quality of the services we provide by investing in training and providing complex services. Today we can boldly say that our company is capable of fulfilling even the most complex of your orders, which have become a daily work of our team. We are glad and proud that our team is doing great job at maintaining the competitive edge in being your reliable business partner. Step by step, with the help of sustainable social responsibility, the most modern of technologies and ever-growing competence, to be a harmonious and advanced company providing logistic services. We work for our clients. There is nothing more valuable than long-term cooperation. We seek this through professional attention paid to our clients. Firstly, we seek to understand the individual needs of each client, and only then we offer the most rational solutions. In the transport area, quick orientation and management are fundamental, thus we make our decisions without delay, provide answers promptly and organize our work professionally. We are responsible not only for our promises to the Clients but also for our social, economic and ecologic environment. We pursue a policy of purposeful responsibility development. To smoothly fulfill all our obligations to the Client, by applying our wealth of experience and competence. 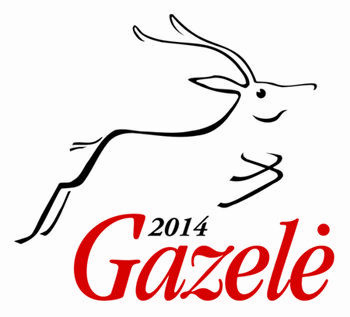 – Measuring and analyzing the processes of our activities and ensuring constant advancement of our work. You - our Clients - encourage us to grow and improve constantly! We want to celebrate and share the news that our company has received the certificate ISO 9001:2015! We appreciate you - each of your Client, we pay special attention to your requirements and needs identification and implementation, as well as satisfaction increase. Client-oriented service quality is very important to us. 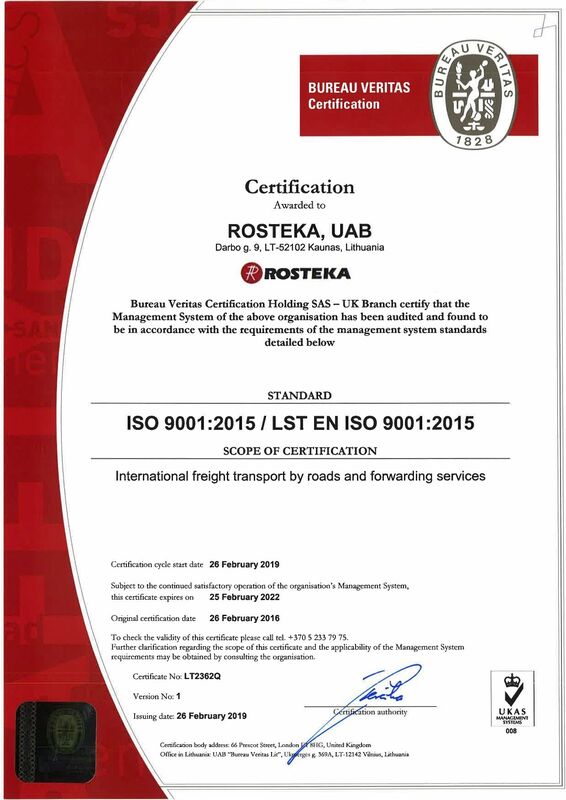 We hope, that implementation of standard ISO 9001:2015 confirms that we are a reliable partner in the field of international transportation. 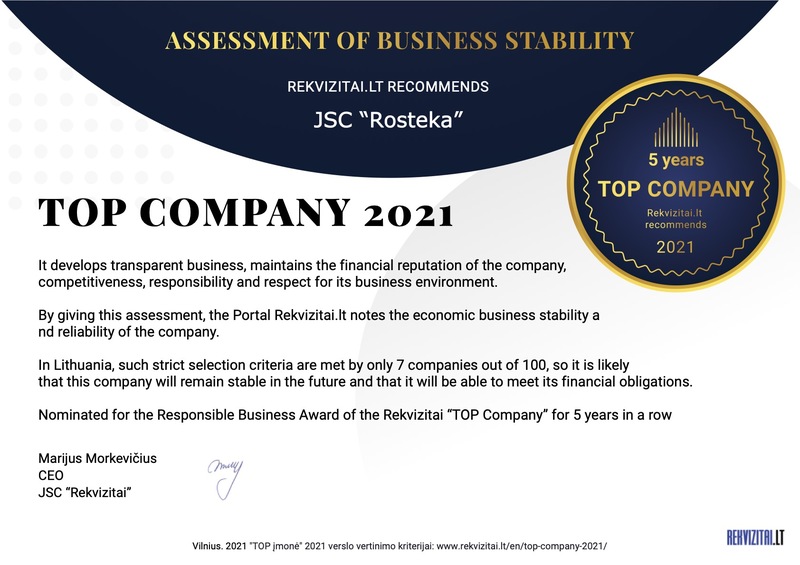 In the 2018 year, UAB „Rosteka” listed in 5% most reliable and economically stable TOP company in Lithuania. This is a respectable rating based on strict criteria. 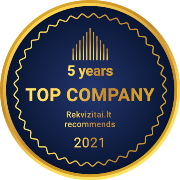 According to data from „Rekvizitai.lt”, UAB „Rosteka” is developing a transparent business, fostering the company's financial reputation, competitiveness, responsibility and respect for business environment.